Jenn from Pocketables has unboxed her Vaio P and she shares it with great pictures. Mine is on it's way too, but it is the 1.86Ghz model.. It will be fan to compare these 2..
Unboxing video and live event will follow here as it arrives. Hi, can you test out the video playback performance, since it supports H264 Hardware decoding, can you Install Power DVD Ultra 8 and try a 720P Apple Quicktime HD Trailer..
Pleeeeeease let us know if it can be 'downgraded' to XP without any problems with drivers etc. I'm in Australia, and besides our lousy version being 3-4x more expensive, we don't get internal 3G or the higher SSD. The answer to these questions will determine who/where I import from. as i know ,the WWAN (with GPS) version for vios P , at the moment only available in JAPAN , is a bit expensive. almost USD1500 ( more or less ). 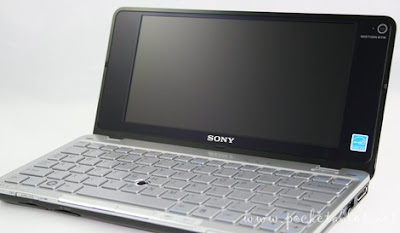 JKK , when you got your vaio P , pls show us the sim card slot where is it. I using the sony tz with wwan from japan ( using option GTM378 ) , no problem at all , but only cant use the edge/gprs , only allow is 3g , i believe the option firmware is blocking on it. JKK or any one , sony P is using which company 3 g modem card ? Option ( using in tz , tx and Z , SZ model for sony ) or Sierra or other brand ? touch screen , which cant find in sony p.
even come with wwan built in..
"let us know if it can be 'downgraded' to XP without any problems"
I agree, windows 7 is the thing to test here. Interested to know how fast would be the 1.83 Atom compared to the 1.6 !! How could you buy it? Where? Anbody know how much the Vaio weighs ? So, they finally shipping it. Looking forward to your review, maybe you could try out if XP works on it. I bought a Sony VGN P698E in USA (2 days ago). Question: Will the wireless verizon 3G work in Europe, especially France? In other words, there is no Verizon there, so will it automatically switch to another wireless provider, properly working and for free?